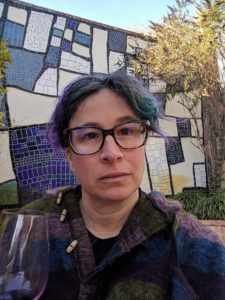 Had tea with yarnivore and friends yesterday during a weekend of rain, cold, and sick kids. I told her about the awesome, awesome book Home Life in Colonial Days and she talked about spinning. I can’t knit, as it hurts my hands too much, but am something of a knitting/textile/ravelry fangirl. I suddenly remembered that I’d gotten the book Crafting with Cat Hair for Christmas and so demonstrated cat-combing using this tool called The Furminator, which sounds like something stupid I would invent but which works incredibly well, producing a huge amount of fluffy, sheddy, cat undercoat. It is best to furminate your cat while saying FURMINATE HER like Darth Vader, or FUR-MIN-ATE like a Dalek. 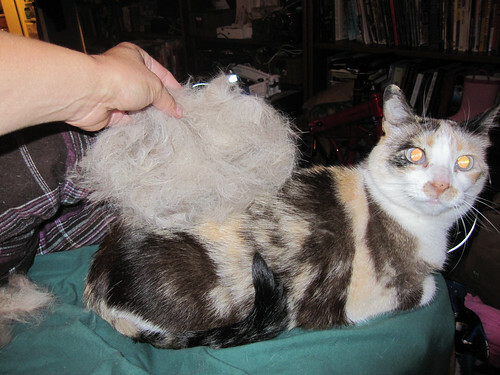 Yarnivore astonished us by spinning several feet of cat hair yarn and then demonstrating how to ply it. Milo and I both tried hand spinning without a spindle. You pull your hands gently apart while spinning the fiber in one direction, which pulls the fibers from the undifferentiated wad of woolly stuff into a triangle called the draft, which leads into the twisted bit that is about to become thread or yarn. Fascinating! We talked about dyeing fiber with local plants like fennel and pokeberry. The thing that fixes the dye is called the mordant; alum sounds like an easy and cheap mordant. I spent some time poking around on Wikipedia to see what it has to say about hand spinning and yarn terminology. I love all the special terminology for textile stuff. Heddle, spindle, roving, batting, loft, worsted, woolen; all very beautiful middle-englishy words. Yarnivore also told me about FiberShed which is a sort of consortium of Northern California fiber people who are trying to encourage local production of textiles from start to finish. Apparently they are trying to start a maker space and are hoping people in other areas will do the same. I thought again of Kevin Carson’s book The Homebrew Industrial Revolution and may take a look at it in the next few days. So, I’m hoping to learn to spin with a drop spindle! Wool, though, not cat hair. Though I wonder if cat hair yarn would be as nice and warm as New Zealand possum yarn? you need to make tons of cat hair yarn and then get someone to make you some socks. it will be like having a warm kitten on your feet all day! I forgot to add another bit of trivia from our tea party. Rose said that when cats lick themselves, something in their saliva, if it gets in the sun, is transmuted to some sort of crucial vitamin while it’s on their fur. Then when the cat licks itself again it gets a nice healthy dose of Vitamin Cat. I have not yet googled for this to confirm or deny its reality. http://jn.nutrition.org/content/129/4/903.full for the Real Sources! Furminators are amazing! Not only do they capture a tremendous amount of fur, but the handle is really well balanced and sets the working end at the right angle to the fur. I’m delighted your cat takes Dalek-attack so placidly. My dog runs screeching the other way, so one person must hold her down.